Vamba was Gita's daughter and she inherited her dam's love for hunting rabbits. When she was a young dog, after watching a coyote hunting video Vamba became a TV addict. She had a very strong hunting drive and her superb voice sounded like a machine-gun in the woods. In her youth Vamba was too high-spirited to become a blood tracker herself, but she produced good ones when bred to Alfi and Falko. With Alfi she produced 7 puppies (D-litter): Ralph Castaneda's Danuta, Rodney Martin's Dayna, John Coldiron's Sawyer (Dandylion), James Barker's Dusty, Bill Siegrist's Jake (Drake), Jason Bartik's Dieter, and Connie and Jack Hume's Gus (Diggit). With Falko she had 6 puppies: Bob Benson's Ida, John Manarte's Brandy (Inka), Ed and Barbara Octocka's Isabella, Henry Sontag's Inkpot, Julia Gruen's Inigo and Nicholas Ganz' Immlemann. Most of them are working dogs recovering deer for hunters. They are also precious and loved companions, and we think of them as Vamba's legacy. When Vamba was retired from field trials and breeding, she enjoyed running rabbits on our property and at the beagle club. 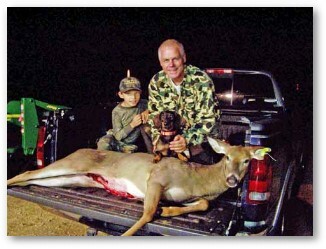 She met an untimely and cruel death when at the age of 10 years she was killed by a coyote. At the time Vamba was hunting rabbits in our fenced 10-acre field, but the coyote, probably lured by her voice, jumped over the fence. 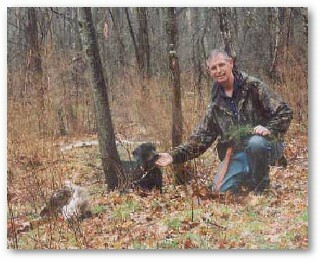 She was not only a great rabbit hunting but a wonderful and loyal friend and my bed companion. Rest in peace Vamba; I miss you dearly. "Dusty has been a great family dog. I was a little concerned because five days prior to my husband picking him up, we had our 4th child. My concerns were unfounded. The two of them get along great. Dusty has never shown any aggression towards Abigail for any reason. They have grown up together and our daughter loves him tremendously. Dusty's main love, however, is tracking. He becomes a different dog. He almost senses when it's time for him to track before he even leaves the house. He gets so excited! He's definitely an aggressive tracker. He's very possessive at the deer and will not allow anyone touch them except my husband. My husband claims he gets better at tracking the older he gets. Please know that we truly appreciate Dusty and that he has a loving home. He is different in some ways from other dogs we had before him. His tenaciousness surprises us sometimes. For such a little dog he does not get intimidated easily." Dayna is still coming along great. This year she's probably found around 10 or so. The only problem I have with her is when the squirrels are out and about. She can't keep her eyes out of the treetops! She'd much rather be a super squirrel dog than a deer tracker so I usually do most of my tracking with her after dark. She's really been a great pet as well and I'm glad I made the trip up to get her and to meet both you and John. Late Ralph Castaneda with Danuta's first find. I will be sending a couple of photographs of another of Danuta's deer recoveries. Steve was hunting about 3 miles out away from the Cabin one morning during Archery season when we received a call over the Radio. 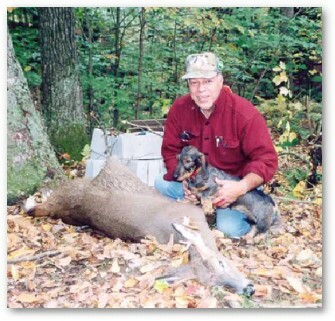 Steve informed me that he had arrowed a nice doe and that the shot was good but he could not recover the arrow. He had tracked it but ran out of blood and was having a difficult time recovering it so instead of contaminating the area he decided to ask for help. He marked the area with tape and waited for Judy and I and Danuta to arrive. We met at a known location near the top of a mountain. Steve was using an ATV and we followed him to the place where he took the shot. I put the tracking collar and lead on Danuta and she could hardly wait. She picked up the scent right away and followed the blood until we saw Steve's tape where the blood stopped. Danuta did not break her stride but continued for about 100 yards and stopped atop a knoll and looked down the mountain side . She was staring at something and we followed her line of sight and saw the Deer about 40 yards away. We all said "Good Girl, Danuta" and she took off after it and claimed it and began her chewing and tugging ritual. She did real good. We lifted the Deer onto Steve's ATV with Danuta on it also. It was Judy's first time on a "find" and she loved it. We all celebrated when we got back to the Cabin. Ida continues to be ONE of the best dogs I have ever had, and I have had and trained hunting dogs all my life.